Pride’s Jazzy Sport 2 is an economical choice with no comprise on features. 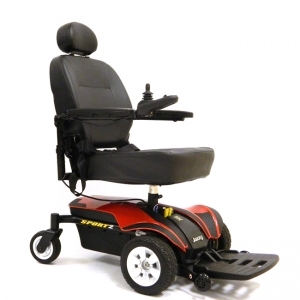 This power chair provides stability and a tight turning radius with its in-line motor and front-wheel drive technology all at an affordable price. The high-back seat with headrest will keep you riding in comfort all day long. 35″ Unit Weight: 129 lbs.